Pages from Italian Anarchist History"(The Anarchism of the Cervi Brothers by Andrea Ferrari, and Italian Anarchist Volunteers in Barcelona and the Events of May 1937 by Aldo Aguzzi)"
Aguzzi, Aldo and Andrea Ferrari. Pages from Italian Anarchist History"(The Anarchism of the Cervi Brothers by Andrea Ferrari, and Italian Anarchist Volunteers in Barcelona and the Events of May 1937 by Aldo Aguzzi)" . Kate Sharpley Library: 2000. 20 pages. Translated by Paul Sharkey. 9781873605226 $3.00/£1.50 Find at a local library. Marzocchi, Umberto. 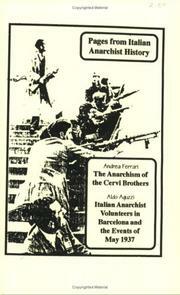 Remembering Spain : Italian anarchist volunteers in the Spanish Civil War (first edition) . KSL: Bulletin of the Kate Sharpley Library No. 16, September 1998 . KSL: Bulletin of the Kate Sharpley Library No. 39, July 2004 . KSL: Bulletin of the Kate Sharpley Library No. 14, March 1998 .